Old-66, the Mother Road, Route 66 and their successor, Interstate I-40 follow similar, if not identical paths from Flagstaff, Arizona, east to Winslow, Arizona. On May 15, 2013 I followed the newer route; taking an occasional detour when any fragment of “Old-66” appeared by the side of the road. At Exit 219, Twin Arrows loomed into view. In this case, the actual twin arrows were examples of ironic, super-realistic art. Not quite out of place, but outsized and iconic, the twin arrows affect all who see them. Utility poles, angled steeply into poured concrete provide an underlying structure for the twin arrows. As I looked to the north, I imagined ancient warriors of the Navajo or Hopi tribes standing seventy-five feet tall, framed against the horizon. Only a warrior of that height could launch such massive arrows from his bow. 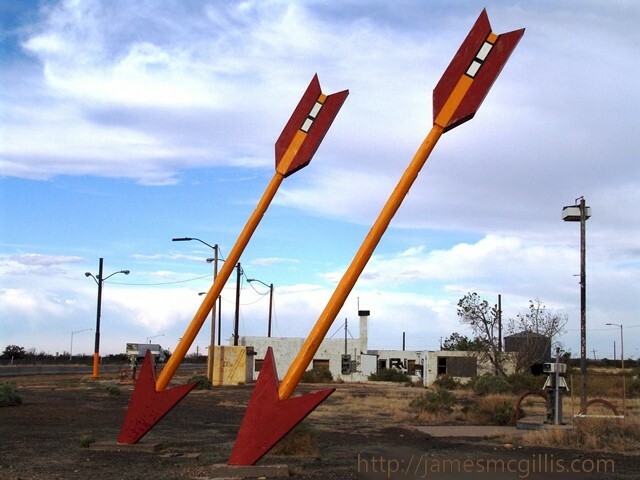 Earlier known as the Canyon Padre Trading Post, the two giant arrows arrived on scene by the early 1950’s. Like the nearby Two Guns outpost before it, Twin Arrows looked like it was in the middle of nowhere. By the early 1950's, anything out there that looked substantial and offered travelers’ services was a welcome sight. 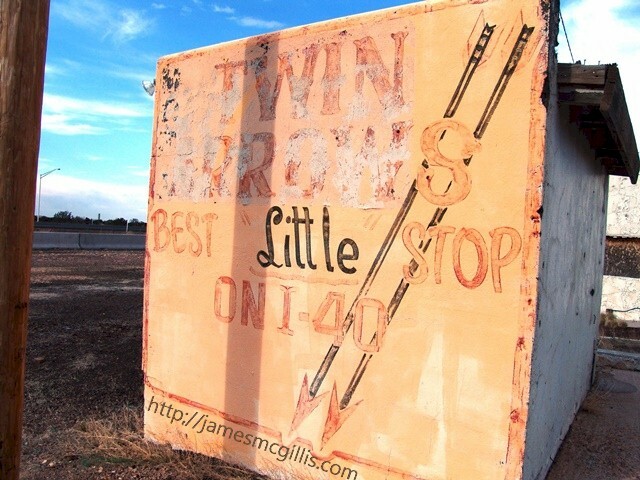 With its 1950’s prefabricated diner and a poured concrete apron at the fuel pumps, the renamed Twin Arrows Trading Post later billed itself as, “The Best Little Stop on I-40”. Although it was a generous-sized property for the 1950’s, when I-40 opened, Twin Arrows days were numbered. Higher speeds and more fuel-efficient autos meant fewer stops in the middle of nowhere. After a succession of owners, the service station and trading post closed for good in the late 1990s. 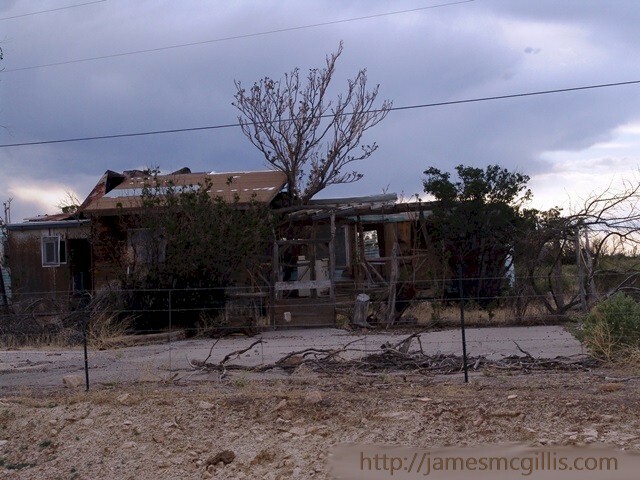 Although the Arizona State Land Department Trust owns the land, the Hopi Tribe owns the derelict buildings at Twin Arrows. 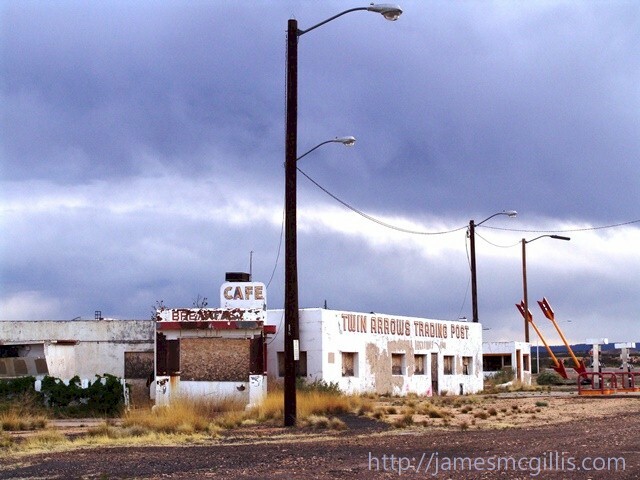 Despite its picturesque, if crumbling facilities, I doubt that economic reality will allow the old Twin Arrows Trading Post to operate once again. Good news regarding this contemporary Indian ruin includes the 2009 all-volunteer restoration of the twin arrows. 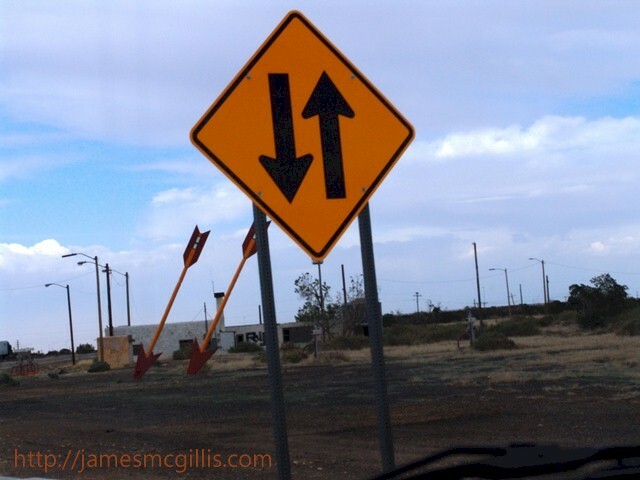 For the near future, at least, travelers on I-40 shall still enjoy the site-gag of two giant arrows that just missed landing on the Interstate. To the north, on the far side of Exit 219 stands the new Twin Arrows Navajo Casino Resort. Unlike the old Twin Arrows Trading Post, the new Twin Arrows exists mainly to promote state-of-the-art Indian gaming. Ironically, there are no motorist services at the new Twin Arrows and no RV Park for the wandering traveler. 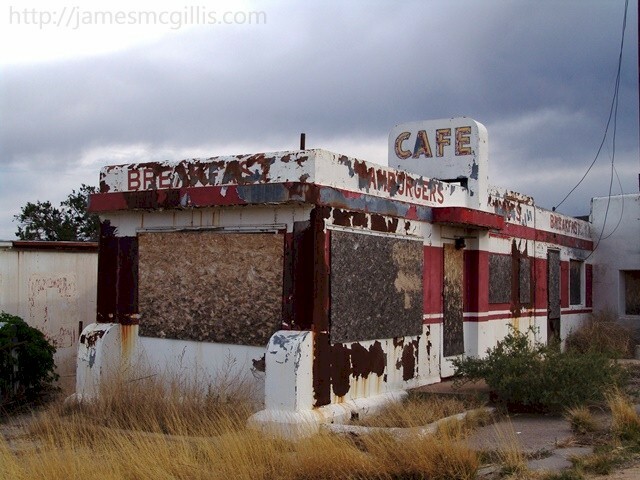 Still in the “middle of nowhere”, the Twin Arrows business plan focuses on food, lodging and “responsible gaming”, better known as, "We win, you lose gambling". Almost two years ago, I was thrilled to see what looked like a major medical center rising from the dusty plains of the Holbrook Basin. When I discovered that it was a new Mecca for gamblers, both native and non-native, I had to laugh. 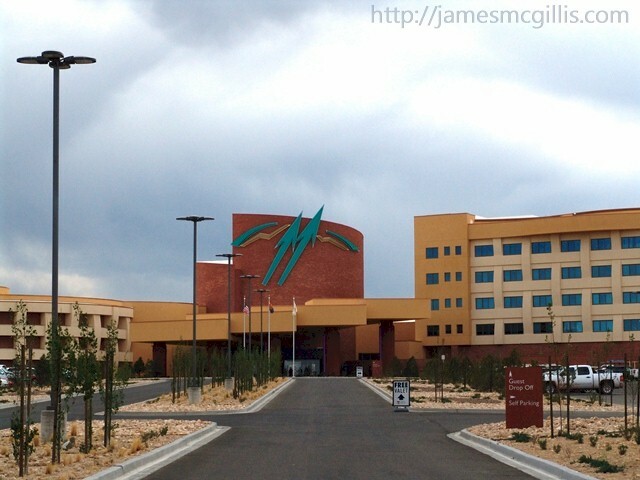 Twin Arrows Casino is the Navajo Nation’s first foray into major casino gaming. Touted as a “job creator” for the Navajo people, I could not help noticing that the “free valet” signs sported a corporate logo, not a Native American one. With a purported cost of $200 million, Twin Arrows’ only nod to the health and welfare of tribal members is the allure of instant riches through “responsible gaming”. As the photos accompanying this article atest, on the Mother Road, the old twin arrows penetrated to the very soul of Mother Earth. Then things changed. Some arrows pointed up toward the promise of free riches from the sky, while others pointed downward, toward the truth of the matter. Now, in our stock market and casino driven world, everything must point up, including the twin arrows on the façade of the new casino and resort. Unless a visitor loses everything at the tables, he or she may still enjoy the proffered luxury accommodations. Still, at its heart, the Twin Arrows glorifies alcohol, food and gambling. As with the original Twin Arrows before it, the novelty of this new venue will attract sufficient business for near-term success. In the future, what shall happen if I-40 travelers tire of stopping at one more kitschy roadside attraction? If the new Twin Arrows fails, the Navajo Nation can still re-purpose it as a much-needed regional medical center. Only time will tell.